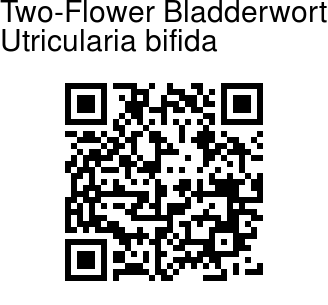 Two-Flower Bladderwort is an annual, carnivorous, terrestrial herb with thread-like roots, runners up to 2.5 cm long, branched, thread-like. Foliar organs are up to 8 mm long, narrowly linear, blunt at tip, 1-nerved. Traps are numerous, about 1 mm across, kidney-shaped, stalked; appendages 2, subulate. Flowers are yellow, borne in racemes 2-7 cm long, erect, solitary, 1-5-flowered. Bracts are 1-2 mm long, ovate to linear-lanceshaped, basifixed, pointed at tip. Flowers are 4-8 mm long; flower-stalks 2-4 mm long, broadly winged, erect in anthesis, recurved in fruit. Sepals are 2, almost equal, 2-4 x 2-3 mm, broadly ovate, tip blunt. Upper lip of the flowers is 2-4 x 1-2 mm, linear-oblong, rounded at tip; lower lip 2-4 mm across, round to obovate, rounded at tip; spur subulate, about as long as the limb. Filaments straight. Ovary ovoid; stigma 2-lipped. Capsules are about 2.5 x 2 mm, ovoid, slightly compressed. Seeds ovoid, testa netveined. 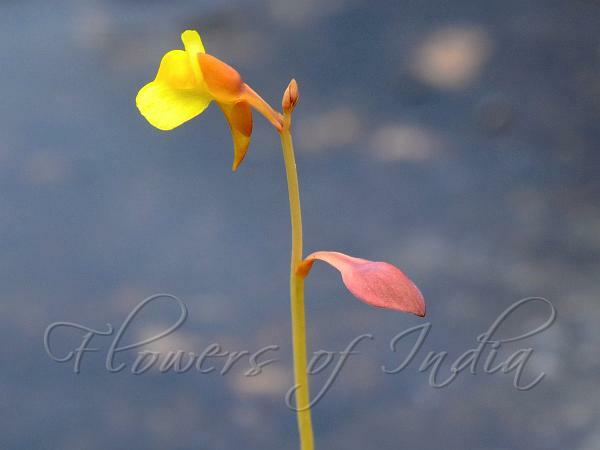 Two-Flower Bladderwort is found in South India, Indo-Malesia to Australia and East Asia. Flowering: July-September. Identification credit: Prasad Dash, N.S. Dungriyal, Janarthanam Photographed at Devarayanadurga, Karnataka.